Hats off to all of our volunteers for their hard work, and many thanks to Yoav and Beau for their work on RTL – it was a major undertaking and we couldn’t have done it without them. We also have 18 other translations that are nearly ready for prime-time, but we need your help with reviewing them. If you’re interested please send me a note at labs@intensedebate.com. If you’re interested in getting involved, now is the perfect time. Please email us at labs@intensedebate.com for information. Thanks! 🙂 We’re also going to be updating all of our translations in the near future to keep them up to date with the full set of strings in use on IntenseDebate, so if you helped out previously, keep an eye out for an email soon! Exciting news! We have 22 newly translated languages that are nearly ready for prime-time, but we need your help. We used a Google Translate tool to generate them, and we’re looking for volunteers to review these translations for any grammatical and contextual errors. If you’re interested, please email us at labs@intensedebate.com and we’ll send you the translation along with some instructions. Thanks! And we have a few translations that are nearing completion: Dutch, Hebrew, Japanese, Norwegian Bokmål, and Vietnamese. This is super-cool! 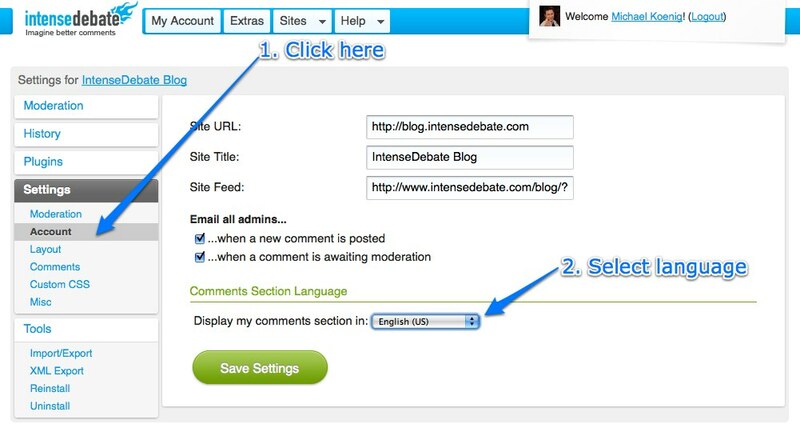 We’re excited to introduce a new IntenseDebate plugin developed by Sam Walters: Comment Translate. Built using Google Translate, Comment Translate gives your readers the option to translate all comments and trackbacks on your post into their language of choice. Sam’s plugin couldn’t have come at a better time as we continue to expand our localization project to make IntenseDebate more accessible for everyone. Thanks to our fantastic group of volunteers, the IntenseDebate comment section is now available in 20 languages with more on the way! To activate the Translate Comments plugin, visit your Plugins Page in your IntenseDebate account at http://intensedebate.com/plugins. Locate the Translate Comments plugin and select “Activate”. That’s it! It’s just that one simple click and your comments can now be translated to 51 languages! Hat’s off to Sam for his contribution!